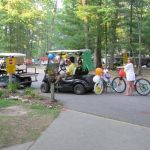 Ask fellow campers about "Higgins Lake / Roscommon KOA" and nearby attractions. This campground is very run down. $55 a night, and not worth the value. Lots are very tight. The outsides of their tent houses are dirty and dingy. Grounds are not kept up. We camped at Higgins Lake / Roscommon KOA in a Travel Trailer. This is a nice park, reasonable price, good location. The sites are tight. Mostly 30 amp sites, only 4 or 5 with 50 amp. The management was rigid. Our neighbors were construction workers, working 3rd shift and sleeping during the day. They had two pickup trucks in their parking space, the trucks did not affect our site at all, and the management insisted on making them move one truck. Also we had some friends come to pick us up to go out and they tried to charge our friends a $14 facility use fee to drive back and get us. Overall a good place to stay if you are visiting Northern Michigan. Sites are shady, don't even think about satellite TV. We camped at Higgins Lake / Roscommon KOA in a Motorhome. Sites are dirt (or mud) and not even close to level. Roadways are dirt and cars/trucks parked on/along side of the roads make driving difficult. Sites were close together. This was a convenient one night stop but I would not use this park again. We camped at Higgins Lake / Roscommon KOA in a Fifth Wheel. Overall this was a very nice campground. They have many (if not most) pull-through sites but only a few are 50amp. The staff was friendly and courteous. The sites seemed spacious. Our full-service, 50amp pull-through was a VERY nice site (#52). Even though this worked well for our stay, I couldn't give higher for the following reasons: 1.) all sites are sandy. I realize the soil in this area is sand, but gravel could be added; 2.) There was only one dumpster, not a far walk, but also not convenient; 3.) If you are looking for kids activities you might be disappointed. Restrooms and showers seemed very clean. We would go back here again. We camped at Higgins Lake / Roscommon KOA in a Motorhome. Can't believe previous reviewers stayed at the same place. Campground is on a hill which usually means trouble. Site we were assigned was not level and we didn't see many/any that were. Stepped out of coach into dirt-sand, very messy. We were lucky it didn't rain. One night was plenty. Never again. We camped at Higgins Lake / Roscommon KOA in a Motorhome. Nice clean KOA. Lots of families and kids but very well behaved. Great site with nice wooden patio. Staff was out standing. Did not like the fact that you got one hour a day free for WiFi and had to pay $9.95 a week for unlimited time for that week. For what they charge it should have been included. We will return. We camped at Higgins Lake / Roscommon KOA in a Fifth Wheel. It appears that this park is going through a update. They have just paved some of the roads and have cleaned the place up. It still has just dirt/ sand for the site. The electric needs to be looked at, we only had about 107 volts and their electric boxes got very hot. We would stay again if needed. We camped at Higgins Lake / Roscommon KOA in a Motorhome. Shady, pleasant, very nice folks, lots for the kids to do. Clean restrooms, small laundry, pull-throughs, big rig accessable, some sites not very level, lots of room between sites. Not at the lake--but centrally located to kayaking, canoeing, birding, hiking, historical sites, shopping. We stayed for a week and we will stay here again. We camped at Higgins Lake / Roscommon KOA in a Motorhome. 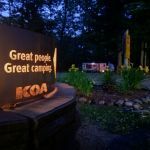 Are you affiliated with Higgins Lake / Roscommon KOA ?